KEEP CHECKING THIS PAGE FOR MORE INFORMATION AS IT BECOMES AVAILABLE!! You must compete at 5 NSPRA rodeos to be eligible to enter the finals. (Canadian rodeos do not count towards the 5 rodeo rule). The top 7 contestants in each region will qualify for the finals and will be awarded points based upon their regional ranking as follows: 1st 120 pts, 2nd 100 pts, 3rd 80 pts, 4th 60 pts, 5th 40 pts, 6th 20 pts, 7th 0 pts. At the SNFR, round winners will be awarded points as follows: 1st 60 pts, 2nd 50 pts, 3rd 40 pts, 4th 30 pts, 5th 20 pts, 6th 10 pts. If a SNFR qualifier is unable to compete at the finals, or if they qualify in multiple regions, the next highest ranking contestant will be allowed to compete. 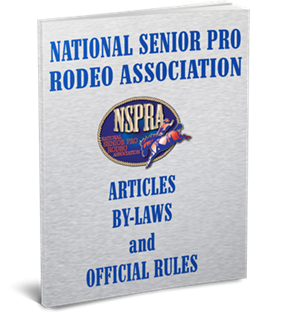 If an event does not fill (21 slots) by this method, the event will be filled with contestants who have competed at 5 NSPRA rodeos. If you are interested in competing at the SNFR you MUST enter even if you are not in the top 8 in a region. If you do not enter during the time entries are open, Monday September 19 and Tuesday September 20, you will not be eligible to go!! Mention you are with the Senior Rodeo Finals and most of them will have a special rate. The Finals Barrel Race will NOT be a 3D format. It will be a straight pay per appropriate age group as in previous years. If you need information on stalls at Panquitch, please call Saunderfer at 801-898-6525. Contestants will be awarded year-end saddles and world championship buckles in their appropriate age category, unless their partner in the team roping or ribbon roping is in a lower age category. In that case, contestant would be eligible for awards in the lower age category. Year-end saddles will only be given in each if the event director is able to get a sponsor or sponsors to cover the cost of the saddle(s) in their event. IN THE TEAM EVENTS ONLY....If you qualify in multiple age categories for the finals, you WILL HAVE TO designate which age category you will accumulate your points. All Around points only accumulate in the appropriate age category. YEAR END CHAMPIONS – are determined by the highest adjusted world standing points in each age group of each event at the end of the season. These awards will be given out during the Hall of Fame banquet on Wednesday, October 5th. Saddles will only be awarded if the event director has secured sponsors for them. WORLD CHAMPIONS – are determined by the awarded points coming into the finals, plus the points won during the finals, in each age group of each event. These awards will be given during the awards banquet after the rodeo Saturday night. In the event of a tie, the first tie breaker will be the contestant who came into the finals with the highest region standing. The second tie breaker will be the contestant placed the highest in the world standings coming into the finals. AVERAGE WINNERS AT THE FINALS – are determined based upon times/scores at the finals and will be acknowledged during the last performance.